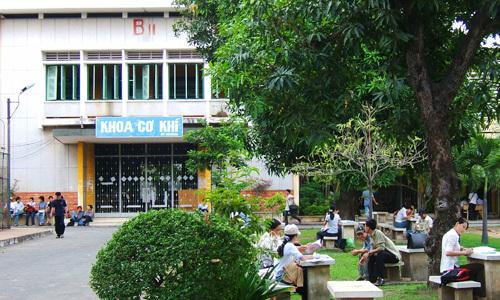 The Faculty of Mechanical Engineering (FME) is one of the longest and largest faculties of Phu Tho National Technical Center, established in 1957 and developed along with the University development history. The Faculty staffs and students are to strive for a leading role in training and research in the South of Vietnam and to become a reliable highly qualified education center meeting the needs of industrial and social developments. The FME offers a modern and practical training program, provide students with knowledge and skills necessary for becoming future leaders in their field. Moreover, it also has a duty to carry out fundamental and applied research to support the industrialization and modernization of the economy, contributing efficiently to the development of technology. The results from research activities have amounted to several technology transfers in areas such as textile, foot wear, food processing, plastic, refrigeration & air conditioning, mechatronics, automation, etc….. The FME offers five major fields of study leading to Bachelor programs: Mechanical Engineering, Mechatronics, Thermal Engineering, Textile and Garment Engineering, Industrial System Engineering; five major fields of study leading to Master programs: Manufacturing Technology, Material Processing Engineering, Construction Machinery & Handling Equipment, Heat & Refrigeration Engineering, Industrial Systems Engineering; and six major fields of study leading to Doctoral programs: Manufacturing Technology, Machine Tools Engineering, Metal Forming Processes, Handling Machinery Engineering, Refrigeration Technology & Equipment, Heat Technology & Equipment. The Faculty has 130 staffs including lecturers, senior lecturers, associate professors and professors. Furthermore, there are also experts participating in training and short-term research and doctoral students working in projects and research programs financed by the Government and/or Industry.